ALL NEW: Workout with Bill Phillips – LIVE! Starting Monday, July 10, at 6:00 pm (MT) and continuing through Sunday July 16, I will be coming to you LIVE (on Fecebook’s live-stream feature) for a series of workouts and talks about the best way to train for fat loss, muscle gain, health and longevity. Each session will include a 25 to 40 minute workout that you can follow along with at home or in your gym. You can watch Bill Phillips’ LIVE Workouts on your iPhone, android, tablet, laptop, desktop, etc. After the workout, join the discussion of how to get the best results from your workouts. I’ll answer your questions live, and give specific do’s and do not’s when it comes to lifting and intense interval aerobics. If you have been to Camp and spent time with me already, you will be reminded of a lot of the workout principles you might have forgotten. I will also introduce new information based on years of research and practical experience… new ways you can boost intensity, increase gains, and get better results faster. If you have not been to Camp and have not yet worked out with me in person, this is a way you can get up close and personal with me and feel what I am teaching and how it can help you, starting that day! It is also a way for you to get a feel for what Camp is like, without making a $1,500+ investment. I’ve been paid over a thousand dollars an hour for personal training and coaching jobs with the rich and famous, celebrities and pro athletes. We charge between $1,500 and $3,000 to attend one of our 3-day Transformation Camps. And, we sell out every event we do. But with this LIVE workout week with me, I am asking for only $13.86 to workout with me live and to hear my best secrets and techniques for making the best progress you have ever mad. At least seven hours of workouts and seminars from me for just $97 (7 x $13.86). And get this, ALL the funds will go to the Colorado Make-A-Wish Foundation so they can continue to help make life better for children ages 2-17 who are facing life-threatening illness. Last year we raised over $11,000!! This year, my goal is to give Make-A-Wish a check for $15,000 in just one week of fundraising. And I am not asking for something for nothing. I want to give you far more value than $97 for the week of Bill Phillips LIVE workouts and seminar discussions. I think I can help you get motivated to workout harder, more often and with better form and strength. That will allow you to lose more fat, get stronger, improve your health and help you live a longer, better life. What you gain could change or even save your life. What you pledge, $97, will immediately make a difference in the lives of kids who need our prayers and support. IF you say YES, Click Here to Sign up! Then, get ready for a full week of awesome workouts with me, LIVE, and also be ready to learn how to get your best results ever. I’ve been doing this for 30 years and I have helped guide some of the world’s greatest transformations… I am confident I can help motivate, educate and transform you too! ++By the way, if you can’t join me live because you have something else scheduled in our live broadcast hour, no problem! Just go to our members-only private facebook group and you can watch the show ON DEMAND… at YOUR time. Watch the live recorded show and join in! Bill Phillips Camp: One spot left! Last Scheduled Camp of the year. Our Last Scheduled Camp for the year is just 15 days from today! We now have just ONE spot left in our last scheduled camp of the year. We are looking for ONE person who is READY to change their health and renew their quality of life. 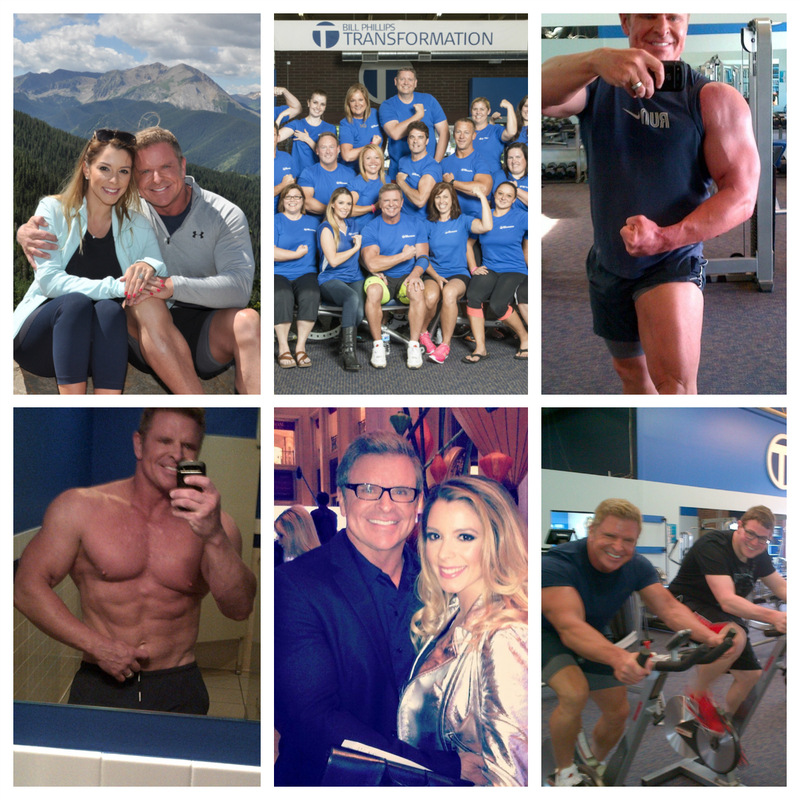 ONE person who can make it to Colorado August 12, 13, 14 to join our Transformation Team. Are YOU the ONE person we are looking for? Someone will take this last spot within hours! I hope it’s YOU! What is Bill Phillips Camp? Each summer we have a special 3-day camp at my Fitness Center in Colorado. At camp, I lead a small group of people from all walks of life, through an experience called “Transformation Camp.” People have come from all over North America and from the furthest away corners of the world to attend. Doctors and lawyers, merchants and marines, moms and dads, college students and retired university professors… all have come to Transformation Camp with one goal in mind: Get Healthy… for LIFE! And that is what hundreds of attendees have gone on to do! Our clients have lost anywhere from 25 ot 125 lbs of fat, while gaining muscle and energy following our healthy, sustainable, proven and practical program of precise exercise and smart nutrition. Medical Doctor, Louise Thurman, calls attending our camp the “…very best health decision she has made in her life.” Since camp, Dr. Thurman has lost her unhealthy weight, gained energy and strength, and is now an active, athletic person who is not letting age slow her down. She is also an inspiration to her patients! The first step all our successful clients took is the one you can take right now… send me an email expressing your interest in camp and let me know you are READY to take action and change your body and health for life! We have ONE spot left. And this is our LAST scheduled camp of the year. Don’t miss out on the opportunity to change your body and life! Someone will take this last spot within hours! I hope it is YOU! Don’t go through your life in a body you don’t like or a body that hurts. You can transform your health with our program — I guarantee it! Your investment in the 3-day Transformation Camp, where you will work with me, Bill Phillips, personally, is $1,495. This includes the workshops, workouts, nutrition planning, and all your healthy meals during the 3-day event, as well as 12 full weeks of ongoing support to help you stay on track and achieve breakthrough results. You will also go out to eat a healthy dinner with me at one of my favorite restaurants on Friday evening. You will have fun and work hard all weekend. Please don’t put off making the decision to get healthy. This will be the best investment in yourself that you’ve ever made. We have ONE spot left. And this is our LAST scheduled camp of the year. Don’t miss out on the opportunity to change your body and life! This last spot will be sold and gone by this time tomorrow! Who else wants to lose 40 lbs of bodyfat while gaining energy and strength? The man in these photos is Steve Kracus. He’s 48 years of age, a husband, a father, and a computer engineer who also plays lead guitar in a local rock band in Ohio. Steve is humble and he isn’t one to brag, at all. So I want to brag for him a bit… this guy is changing his body and life right before my eyes. He has worked with great effort and determination to get rid of more than 40 lbs of bodyfat while he has gained a lot of solid muscle since he first came to transformation camp. He has literally made himself ten years younger physiologically. He is changing his body type completely… becoming a muscular athlete even though he started out not long ago as an average, aging American man. He is not just ‘losing weight’ — he is replacing fat with muscle and reshaping his body… and he is doing this in his late 40s. His heart health has improved even more than his body! The guy is going to be in the best shape of his life by the time he hits 50 and even then there is no stopping his improvement. If you are in ‘before photo’ condition now, my advice is to BE LIKE STEVE. And by that I mean, start now to renew your body and life… and don’t give up! You can rebuild yourself… YOU REALLY CAN! If you want my help, write to me and we will help you sign up for my transformation camp: Bill@Transformation.com — and if you don’t want my help, still do it anyway! Start by making the resolute decision to change. Take a before photo. Set an inspiring and specific goal of where you want to be in 12 weeks and 12 months. Start an intelligent and proven plan which includes balanced and healthy eating, complete nutrition, as well as strength training and aerobic exercise. Then connect with other good, positive people who are also making healthy changes so you can benefit from mutual and powerful support, encouragement, and accountability. Keep in mind that your healthy changes will inspire others to start getting fit too. And finally, never underestimate the change you can make; never underestimate the difference you can make. You have the ability to change and no one can take that away from you. You CAN do it, I promise! Very happy and grateful to become 51 years young today! I was putting together some snapshots that show a quick reflection of my life today and I thought I would share it here with my blog readers. I’m telling you, with fitness as a consistent part of your lifestyle you don’t have to look bad, feel bad, and become overweight and unhealthy as you age. With just a half hour of exercise a day, and relatively healthy eating most of the time (and taking my vitamins and creatine) I stay at about 8.5% body fat and my muscles are almost as strong as they were 15 years ago. I can’t do everything I could when I was much younger, but I can do a lot and I am grateful for that. My doctor says that fitness has kept my heart health excellent and that is a benefit of working out I really value these days. I am so lucky to be married to a beautiful and smart woman…Maria is my best friend and love of my life. Her and I have both been through health transformations of our own a few years ago. We know what it’s like to be out of shape which makes being fit feel that much better. Maria and I get to do the work we love — helping others rebuild their bodies and renew their lives at our Transformation Fitness Center here in Colorado. We keep work balance though — we take plenty of days off to travel and enjoy life and our time together. In this brand new 25 minute video Bill Phillips trains with Mark Bell, one of the best strength coaches and strongest men in the world. Bill Phillips is traveling around the country this summer learning from experts like Mark Bell and others; always looking to improve, even at age 50 and with over 30 years of experience teaching transformation and Body-for-LIFE. Watch the video to get some new insight about what workouts produce strong results and also get some motivational insight along the way!